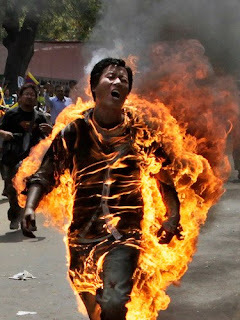 New Delhi, March 26: A Tibetan youth today set himself on fire at a mass protest rally organised by the Tibetan Youth Congress in New Delhi, days ahead of Chinese President Hu Jintao's visit to India. The youth identified as Jamphel Yeshi aged between 26 -29, a resident of New Delhi, set his body on fire at 12:25 pm Indian standard Time. He was rushed to a nearby hospital. The present condition of the youth is not immediately known. In a repetition of the fiery protests that has engulfed Tibet for the past years, the youth Jamphel Yeshi, enveloped in high flames came out running and shouting from a nearby closed compound. 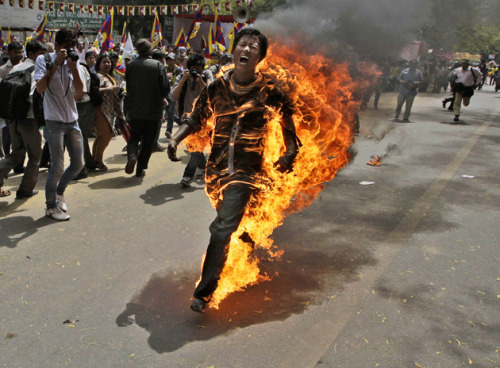 Running for about 100 metres, Jamphel Yeshi then fell to the ground where the Indian police and Tibetan activists tried to douse the flames. After almost ten minutes, the youth was carried in a police car to a nearby hospital. From the back of the vehicle his severely burned feet and flesh peeling off with the burns were clearly visible. Tibetan activists from all over India are currently gathered in New Delhi to urge the international community to intervene in the ongoing critical situation in Tibet and also show Tibetan's protest against Hu Jintao's visit. Today, March 26 also marks a century since the declaration of war against the Manchu occupying forces in Tibet in 1912. 30 Tibetans in Tibet have set their bodies on fire in Tibet since 2009 demanding the return of His Holiness the Dalai Lama from exile and freedom in Tibet. Pawo Thupten Ngodup was the first known Tibetan to have self-immolated for the cause of Tibet in 1998. Jampa Yeshi's self-immolation today took place at almost the same place where Pawo Thupten Ngodup self-immolated. (CNN) -- The Tibetan protester who set himself alight in the Indian capital ahead of Chinese President Hu Jintao's visit this week has died. The 27-year-old man was admitted to hospital in New Delhi Monday with 90% burns to his body, but doctors could not save him and he died on Wednesday, said L.K. Makhija, the head of the burns ward at the Ram Manohar Lohia hospital. Dramatic pictures showed the man, named by the London-based Free Tibet group as Jampa Yeshi, running along the street in flames as hundreds of protesters gathered outside the Indian parliament to protest against Chinese rule in Tibet. Many ethnic Tibetans fled Tibet for India with the Dalai Lama in 1959 after a failed uprising. New realities for Tibetans in China Tibetans say they're not safe in Nepal Has China improved Tibet? President Hu was due to arrive in India for Thursday's BRICS summit of emerging economic powers, which includes India, China, Brazil, Russia and South Africa. Self-immolation is a common form of protest for Tibetans who want genuine autonomy from China and accuse Beijing of repression. More than 30 of them took place in the last year in China, Tibetan advocacy groups say. They follow an increase in security measures by the Chinese authorities in response to unrest among Tibetans in western areas of China in recent months. Some in Tibet have advocated independence from China. But the Dalai Lama, the exiled Tibetan spiritual leader, and others have said they favor genuine autonomy and resent the slow erosion of their culture amid an influx of Han Chinese, the most numerous ethnic group in China. Activists say the disturbing acts of self-immolation reflect an increasingly repressive environment under China's control. Beijing rejects accusations of oppression of Tibetans, saying that under its rule, living standards have greatly improved for the Tibetan people. Chinese officials have described the self-immolations as "extreme" acts.